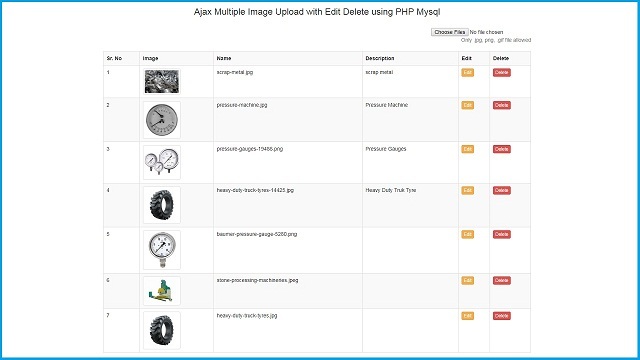 In this you can find not only how to upload multiple image or file without submit form using Ajax Jquery with PHP but also you can learn how to edit or update image information in database and folder also and delete or remove image from folder and from database also. In this one topic we have covered multiple topic, so you can learn lots of things from this single post. In one of our tutorial we have already discuss how to upload singe file without submit form using PHP with Ajax Jquery. But here we have upload multiple images with our using form submit event by using Ajax JQuery as front end and PHP and Mysql s back end. When Multiple Images uploaded into folder then after we have insert uploaded images details like image name and description in table. So every uploaded image data will be inserted into Mysql table. After uploading image we have by using Ajax function fetch image details from Mysql table and display on web page in table format with edit and delete button. This all upload of multiple image and after that inserting of uploaded images data into mysql table process has been done without refresh of web page because we have use Ajax for this things with PHP and Mysql. After successfully upload of image with data inserted into Mysql table. Now suppose we want to edit or update some details like image name or image description then this things we have also done by using Bootstrap modal. When we have click on edit button then that particular images details has been come with pop up Bootstrap Modal. Here we can not only change image name in Mysql table but also it will change image name in folder also. Same way in delete or remove operation it will not only remove image data from Mysql table but also it has remove or delete image from folder also. Here this all process has been done without refresh of web page because we have use Ajax Jquery with PHP Mysql. In short, In this post we have done insert update delete multiple image in PHP with Mysql. I try this code, but I don't upload new images, beacuse script show is uploaded but I don't have new image on site and in folder and in base sql. I love this , but I can't get but one image to upload at a time, and sometimes when I try to upload a single image, it overwrites the existing image. Is there something I am missing? Thank you this beautifully written. I love the way the lecturer teaches and provide proper source code with the content.